A photogram is a photographic image made without a camera by placing objects directly onto the surface of a light-sensitive material such as photographic paper and then exposing it to light. This method is also known as cameraless photography. My process leaves out the photographic paper and the chemicals. 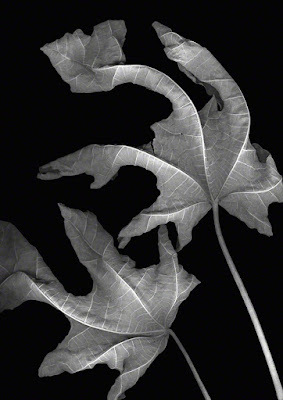 Cameraless photography can easily be accomplished by arranging objects, in this case leaves, on the top of a flat-bed scanner and exposing or capturing the image digitally. Fig leaves dry to a light brown color but become a lovely silvery gray when rendered in black and white. Each leaf dries to a different, unique shape as its moisture evaporates. These images are printed on a "metallic" paper that enhances the silvery luminescence of the image. The leaves below are from the Mule's Ear (Wyethia) a North American flowering plant in the sunflower family. The leaves are light sage green in color but become a silvery gray in black and white. These images are printed on a "metallic" paper that adds a luminous quality to the finished print.